People seem to be weirdly taken aback when I tell them I have always booked directly through Disneyworld (aka the Walt Disney Travel Company), I think there is a misconception that it is ridiculously expensive amongst other things, but there are SO many reasons in which I have always booked with WDTC and stayed on site at WDW and I wanted to share them with you all! 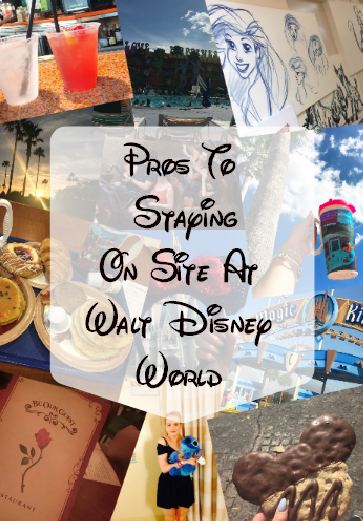 So, without further ado here are the amazing PROS to staying on site at Walt Disney World Resort! Staying on site comes with many perks that make everything from travelling to breakfast so much EASIER... which is what I am all about! Disney's Magical Express is a coach service that picks you up from MCO (Orlando Airport) and drops you to your Disneyworld resort and visa versa when it's time to say goodbye. I love hopping on these coaches as soon as I arrive in Orlando, they are such an exciting way to get the real Disney buzz from the word go. The drivers are always super friendly and helpful and luckily for up Pop Century seems to always be one of the first resorts to be dropped off so you don't have to go round the whole of WDW waiting to get off! This is a free service that you can claim once you've booked your Disney holiday and is perfect if you aren't interested in hiring a car or paying for a taxi/uber from the airport! Disney life from sunrise to sunset - The magic never stops! Well this one may be a bit obvious but it's so true! From the moment you rock up and check in to the hotel you are fully immersed in the Disney way of life. All staff members (that I've encountered anyway) are always wonderful, you are surrounded by Disney themed pools, rooms, music, food... and even soap in your room! I just love going in for breakfast at 6:30am, seeing Mickey shaped food and watching the staff break into 'the twist' in the middle of the canteen! EMH - Extra Magic Hours! This is something my boyfriend and I always take advantage of, even if some people do say to avoid it! EMH's are hours in which only dinsye resort guests are able to access the parks. For example Animal Kingdom opens at 9am but on certain days there are EMH at 8am - so between 8am and 9am only guests of WDW resort are able to enter the park. They have EMH for all four main parks both in the morning and in the evening. We love to head to whichever park has the morning EMH's and cram in as many of the popular rides as possible before the park opens officially. This sometimes mean we can ride 4 rides before our fastpasses for the day even start! If you want a post on which rides are the best to fastpass... let me know! We have never hired a car in Orlando. Never, ever and I don't think we ever would. Disney's transportation system is SO easy to use and saves a lot of time and money in my opinion. At your resort you have a number of different bus stops (basically a mini bus station) and each stop is for a different park/location. Staying at Pop Century these buses come every 10-20 minutes or so, and I believe it is the same for all resorts. Yes, sometimes the queue is so long you can't get on or you may have to stand and/or be cramped in, but I honestly cannot fault the system. You are taken straight to your destination and in some cases like Magic Kingdom this saves precious time as they drop you at the gates rather than at the car park where you then have to get a monorail or ferry to the park! With a car you have to pay for gas, parking as well as the hire - whereas using the bus system is totally and utterly free. Yes you have to rely on them but you get used to it pretty quick and I find it a lot more enjoyable than putting the pressure on my boyfriend to drive everywhere. Your park tickets, your fastpasses, your room key, your dining plan, your photo pass and if you want - even your bank card! Your magic band is your KEY to the kingdom when it comes to Walt Disney World and these are totally complimentary when staying at a Disney resort. The only problem is..... choosing a colour! I went for grey last time as I thought it was the chicest shade to go with all of my outfits, cool much? The Disney dining plan is a simple way to keep your trip stress-free and ensure you save money whilst you're away. Even though I've never purchased a full dining plan, on our last trip we were given FREE breakfast with our booking which saved us hundreds of dollars across our fortnight onsite. Fingers crossed if we're able to go over the next couple of years I'd love to opt for the Quick Service plan, as it's all the foods and services we already eat and use whilst at WDW plus more (#snackcredits) and will save us SO much money in the long run. FastPasses are one of those things I stress about the most before I get on that plane. I always have an idea of what rides I want (and need) to fastpass and always like to be organised as to where I'm going on what day etc. Staying on Disney property allows you to book your fastpasses for rides and shows 60 days before you arrive! You get three fastpasses per day to use (these have to be at the same park) and if you are like me and super organised you can sit and nail your trip in one evening 60 days before you're on the plane! It's doesn't cost an arm and a leg! Have you ever stayed on site at Disney? What are your favourite hotels to stay at? I'm dying to stay at Art Of Animation on my next trip! I have heard of the extra magic hours - but everything else you mentioned I didn't know about!